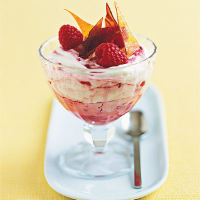 Enjoy this creamy, healthy dessert while raspberries are at their plentiful best. This fool can also be made with any other seasonal soft fruit. Halve the passion fruit and scoop the pulp into a medium-sized bowl. Add the raspberries and lemon juice with 25g caster sugar. Stir lightly with a wooden spoon, crushing the fruit just enough to release some of their juices, but still keeping the raspberries whole. Set aside for 10 minutes. While the fruit is soaking, whisk the egg whites, using an electric or balloon whisk, until stiff peaks form. Gradually whisk in 100g caster sugar, one tablespoon at a time, until thick and glossy. Spoon the cràme fraîche and yogurt into the fruit. Then, using a metal spoon, fold in the egg whites leaving the mixture roughly marbled. Divide between six serving glasses and chill until firm, for up to 2 hours. To make the caramel decoration, preheat the grill to high. Cover a baking sheet with lightly-oiled foil and sprinkle the remaining sugar over in an even layer. Place under the grill for 1-2 minutes until the sugar dissolves and caramelises. Remove from the grill. The sugar will cool to form a sheet of wafer-thin caramel. Break the caramel into shards and use to decorate the top of the chilled fools. Add the extra berries and serve immediately. If you want a smooth fool without the passion fruit seeds, strain the pulp through a small sieve.